The recent interweaving between the worlds of techno and noise has already earned itself a nickname ('technoise'), and has spent the past eighteen months shifting into high gear, as witnessed by the explosive career growth of artists like Ital, Container and Metasplice, or the noisy dancefloor outbursts of Truss' MPIA3 project and any number of L.I.E.S artists. As it has rapidly spread through the underground, particularly in America, it has also attracted its fair share of adherents, commentators and detractors. It is just as these lines are being drawn that Ali Wells' Perc Trax has entered the fray, with new sublabel Submit dedicated to exploring this general sonic junction. It was launched last year with four dub remixes of very early Einstürzende Neubauten tracks written by Perc himself, who expressed the desire to subtly rework the material without radically changing it. In the last two years Perc Trax has been particularly incisive, with Forward Strategy Group, Ekoplekz and Truss contributing standout releases and Ali Wells' own Perc material moving ever closer to industrial music. 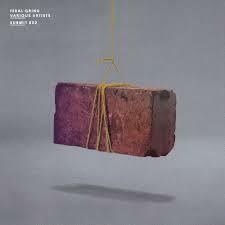 Feral Grind is another departure, although a somewhat predictable one, an album-length sampler of mostly known artists in the noise and industrial communities. Listening to this compilation, Wells' interest in this area resonates quite clearly. Far from being a collection of obvious club tracks along the noise/industrial divide, he and co-curator Justin Farrar have chosen a much broader spectrum of material that ranges from nearly-ambient, beatless pieces to tracks that are only steps from proper techno. It leans heavily on artists that are well-known or emerging to prominence in both the noise and techno-leaning worlds: Pete Swanson, Bleaching Agent, Henry & Hazel Slaughter, Burial Hex, and Hive Mind all have quite lengthy discographies, and Profilgate and Prostitutes have earned significant recognition more recently. There's an emphasis on Cleveland, Ohio and Philadelphia's now-recognized noise scenes, which have received exposure on Spectrum Spools and Morphine. All in all, the album itself is well-researched and also very listenable as a single piece; in the future it could easily prove to be a handy historical review of a brief moment in time. When it comes down to the individual tracks themselves, in some cases the choices are revealing. Bleaching Agent is far much better known for bizarre techno experiments as seen on Mira, Opal Tapes, and Komiche, but the piece here is a purely drifting, beatless effort. The first track on the album by unknown Housefire is an extended ambient exploration that tends towards sublime, submerged beauty, not words often associated with this movement thus far, but besides Hive Mind's closer, it's the only one the description could really be applied to. The tempos on the more beat-driven tracks vary from thrashing, head-banging wildness around 140 BPM to rolling electro and standard techno tempos on the pieces from Prostitutes and Swanson, and into the low 100BPM range. Overall, the album audibly alternates between more rhythmic efforts and ambient ones, essentially track by track, until the two tendencies converge slowly at Feral Grind's end, in the final four from Burial Hex, Mincemeat Or Tenspeed, The David Russell Snake, and Hive Mind, sequentially. This is the most challenging stretch of the compilation, as well as the most revealing of both the promise and the problems of the techno/noise crossover. Something like 'Final Love (Feral Love Dub)', with its dusky, decaying sonics and clear sense of structure, certainly has noise and industrial roots, but it's also quite easy to imagine it played in a DJ set. The next two pieces have rhythmic backbones, but they're increasingly submerged, eventually to the point where the rhythm is placed at the service of the noise, rather than vice versa; the purpose of releasing such material in a more DJ-centred context is slightly vague. Hive Mind's closing piece features a single, reverb laden rhythmic element that slowly grinds away against a dense carpet of drones and buzzing electronics. Listening to the music compiled here by Wells and Farrar, it is quite easy to hear the limitations of some of the artists whose beat-driven ideas fail to translate into potential for movement on the floor, as well as those whose combinations are more adroit and make a better compromise between the two extremes. Arising as it does from the juncture of two historically separated scenes which have both inspired their own radically purist interpretations, Feral Grind explores a junction that was always destined to inspire its share of opinionated chatter. Even more so than techno, noise and industrial have always been difficult areas because so much of the music emerges on tiny labels, and getting any kind of definitive overview at any one time requires an awful lot of digging and research. Noise especially tends to resist this because a lot of it is performance art in a sense, and the artists often toss off reams of recordings at a very quick pace. With mostly-improvised music like this - free jazz is another thing that comes to mind - arriving at a consensus as to what is definitive is always particularly hard. Even walking into this well prepared, it's a difficult area to try to cover over the course of a few tracks. Although these crossover sounds have been emerging steadily from widely scattered sources, Submit is actually the first label to put so many of these threads in one place, which itself is valuable. Over the next years, the phenomenon is only sure to increase, and major artists with the talent to differentiate themselves from less focused experimenters will naturally emerge. As for the accomplishments of the burgeoning techno-noise crossover itself up to this date, the verdict remains out, and Wells isn't trying to pass final judgment with the music released here. Feral Grind is a snapshot of a movement still in its early stages of coalescence; as such it remains open-eared and searching, and that is ultimately to its credit.